Seeing that I have a lengthy MONTH of holiday awaiting me, I might as well start my blogging recovery phase. See how I make terms up as I go along? That’s because I now have time on my hands. I got a few people that loved my first Monday Magazine post that was all about Pantone’s colour of the year; Marsala. If you haven’t read it yet please check it out. Now from what I’ve seen, the biker jacket is around every season but it just becomes BETTER. By better I mean the style selection expands and you’re bound to find one that you’re really going to love. Before I settled on my biker jackets that I gave you a slight looksee on in Friday’s post, I was scouring the market before I just went and purchased it. I settled on 3 biker jackets at Edgars (Free2Bu and Kelso) because I really loved their style and quality and now declare myself bankrupt. To avoid you darlings becoming like me, I did some research and found that there are MANY MANY MANY options available. From high end to average to budget prices. 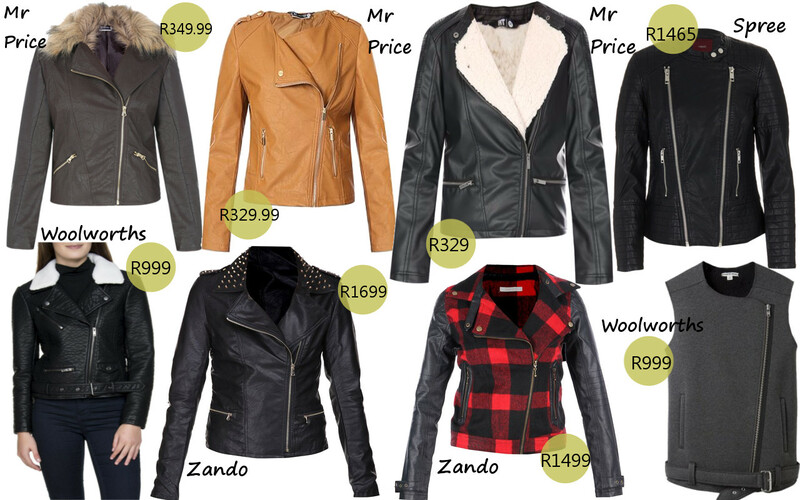 If you’re not completely into the whole leather look, you can always try a combination of two fabrics like the one from Zando. I’m swooning over the Sass: Zando biker jacket with the stud detailing on the collar and shoulders. Seeing that I’m doing the whole magazine-ish thing, I found some great styling from nail art to a day and night make up look. I’m particularly loving the messy top bun and black head band. For the nail art, if the trims(zips and studs) on your jacket are gold then you would most likely go for the gold and black nails and if the trims are silver you would go for the silver and black nails. 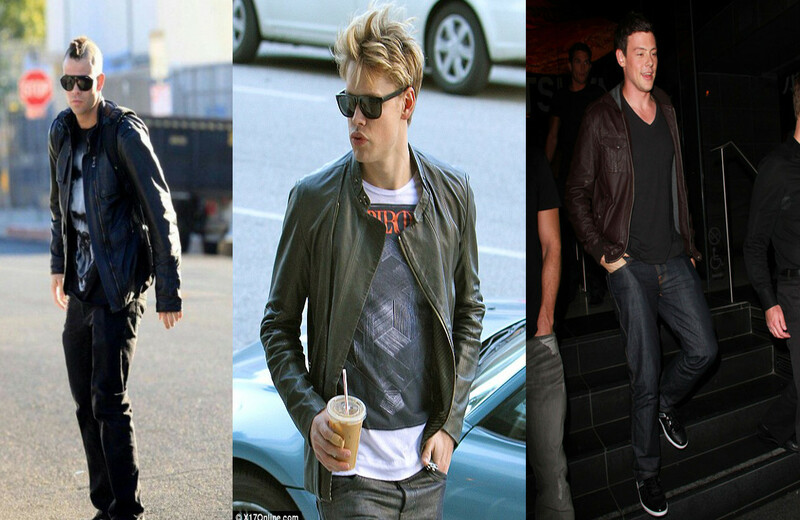 For my celeb inspiration I found three different celebrities wearing the biker jacket in three different ways. From left Jessica is steering away from the grunge look and giving it more of a girly approach with a skirt. If one had to mention a burnt orange biker jacket I would say no no but seeing it on lady far right I think its stunning. This is a new one for City Girl Vibe, featuring some styles for the guys. Recently I got an email from a reader complimenting my fashion features but asking why I never post goodies for the guys and that’s when I thought I would squeeze some in my new Magazine Monday. 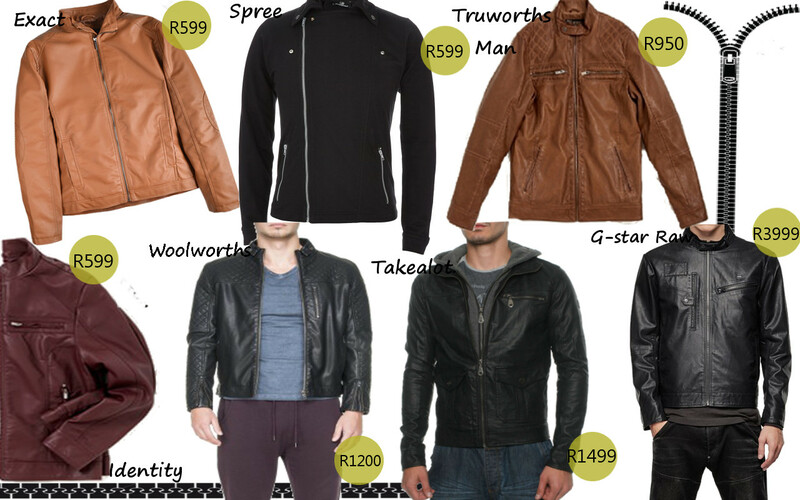 While doing some research on guy’s biker jackets I found that there are actually very few retailers that cater for the guys and the ones that do are quite pricey or really affordable but the quality is not very notable. South African retailers definitely need to see the gap in the market. Let’s talk some Mancrush Monday. If I could play stylist with my boyfriend this is how I would style his biker jacket. How perfect is it for winter? Oh and seeing that we’re having the strangest winter of all time in the Cape, these sunnies are so suitable for that odd day of sunshine. How I love the matching gold wrist watch to the gold zip. Yay or Nay for the biker jacket?! Will you be rocking this trend? Tags: Accessories, Adidas, Autumn, Beauty, Biker Jacket, Campus, Cape Town, Celebrities, Chord Overstreet, Cory, Edgars, Exact, Fashion, Fashion Blogger, Free2BU, G-star Raw, Glee, Holiday, Identity, Jessica Alba, Jewellery, Kelso, Lipstick, Make-Up, Mancrush Monday, Men's fashion, Monday Magazine, Mr Price, Nailart, Online Shopping, Pantone's Colour Of the year, Shopping, South Africa, Spree, Street Style, Student, Style, Style Inspiration, Takealo, Trends, Truworths, University, Woolworths, Zando. Bookmark the permalink. Previous post ← ♥Where did i go?